To celebrate her little sister's birthday, Crystal Patterson took her and some friends to hike a mountainside waterfall near Salt Lake City. But then, Crystal, 21, fell 10-12 feet down the waterfall, landing on a ledge, officials said. She was, in essence, trapped there, clinging to the rocks, her feet in icy water racing past her. Crystal's sister, Amanda, 16, called 911, but couldn't pinpoint their location. A helicopter from CBS affiliate KUTV in Salt Lake City wound up spotting the group, and a specially-trained rescue team and chopper arrived some two hours after Crystal slipped. All the while, Crystal knew that if she passed out, the waters would carry her away and she'd crash down the rocks. And she was barely conscious and suffering from hypothermia when she was rescued -- her body temperature reportedly down to 93 degrees. On The Early Show Thursday, Crystal and Amanda told their story to co-anchor Harry Smith, along with the man who actually pulled Crystal to safety, Kenneth Johnson of the Utah Country Sheriff Rescue Team. 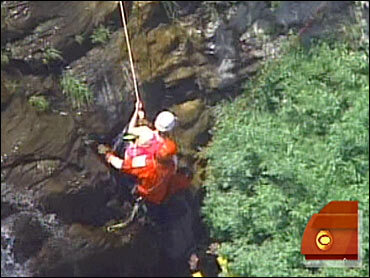 To see the interview, along with dramatic footage of the rescue, click on the arrow in the image below.